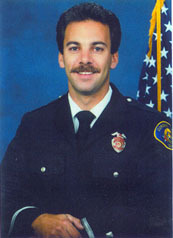 Corona Fire Captain Donald M. Hibbard, 36, apparently was on his way to the Santa Ana Fire Academy, where he was an instructor, when his car struck a concrete wall on the southbound Costa Mesa (55) Freeway in Orange. The accident occurred on Friday, November 30, 2001, at 9:05 a.m. near Lincoln Avenue, the California Highway Patrol said. “What makes this so tragic is that he was so well-liked,” department chaplain Bill Peters said. Hibbard, survived by his wife and four children, was known for his volunteer work. He helped maintain the department’s breathing apparatus and coordinated its fitness program. Mike’s wife, Tiffany Hibbard, is a teacher at Riverside Christian Schools. Please keep Tiffany and her children in your prayers during this time of loss.